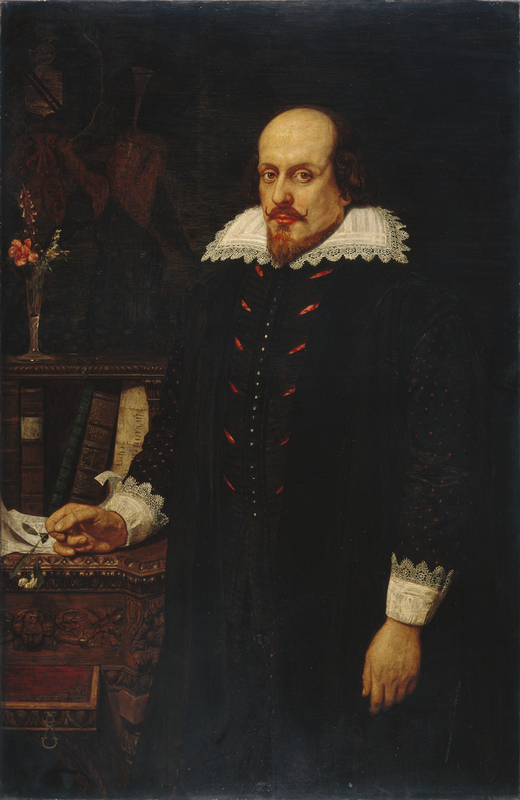 A three quarter length portrait of the playwright William Shakespeare standing beside an ornately carved wooden desk to the left. One of the desk draws is open revealing a red lining. Shakepeare’s right hand rests on the desk and in it he holds a single stem of flowers. His left arm is by his side. He is dressed in a black with white lace collar and cuffs. The jacket is slashed either side of the buttons at the front and on the sleeves, revealing red fabric underneath. On the desk are Shakespeare’s sources of inspiration – books by Chaucer, Boccaccio and Montaigne, Plutarch’s Lives and The Gesta Romanorum. Above the books to the left is a glass vase of flowers behind which is a tapestry. On the tapestry there is a figure blowing a trumpet between the masks of Comedy and Tragedy. The figure also holds a laurel wreath to symbolise fame. Within the wreath is a coat of arms containing a spear as a pun on the playwright’s name. William Shakespeare 1849 Ford Madox Brown 1821-1893 Oil on canvas Brown was attracted to literary subjects, in this case the playwright William Shakespeare. As there was no known true likeness of Shakespeare, Brown drew on various sources to create as authentic a portrait as possible. He also used a live model to give the picture immediacy. On the desk is Shakespeare's own source-material, including books by Boccaccio and Chaucer. The tapestry has a figure blowing a trumpet and holding a laurel wreath to symbolise fame. Within the wreath is a coat of arms containing a spear as a pun on his name. The frame, designed by Brown, echoes the laurel leaves of fame combining them with English oak leaves, and with masks of comedy and tragedy.